The Field Studio is in a very convenient private place. Off Route 375 at the end of Hasbrouck Lane is the studio driveway that goes along a large field. As you go down the field driveway you will see a very unique building surrounded by over 65 acres, the studio property is 7 acres. The land is so special because of its location, so private yet very close to town, you can get the newspaper in 3 minutes. The forest is all around, and the beautiful field is where there might appear deer, turkeys, geese, fox and other wild animals. There is a hammock hung between two trees, a table with umbrella and chairs to hang out on close by in the field. You will see an unobstructed view of the mountains and sky. Also you might see geese taking off over your head as they assemble in a nearby pond. There is parking in front of the Studio. The building is nature-inspired with two large windows creating the entire front of the building. It is completely insulated with an interior color scheme of light brown that works with the original wood and beamed ceiling. Once you are inside, the huge windows facing the field allows one to feel so connected to the outdoors and yet protected in the pleasant cozy indoor space. The studio is one large space with pine floors. The two unique vintage heavy doors were found in a Massachusetts flea market. One door is square with square glass inset and the other arched with a triangle glass inset. The original barn wood room has a charm all its own that will give you a warm, comfortable, uncomplicated living space. There’s lots of lighting fixtures but the great large hanging iron chandelier is especially effective. A 4 post queen bed with night stands over by the side window give graciousness and distinction. There is a coffee table and couch where you can relax, look out the windows, have a glass of wine or watch a movie. The studio has a flat screen, Apple TV, WI-FI, Bluetooth for your tunes, and Netflix. All you need for access to the outside world. Behind the couch is an iron marble top table with 4 different coffee makers and an espresso press. The free standing butcher block is there to help with preparing food. An antique bakery shelf holds dishes, pans, a toaster oven and a microwave. There is 4 burner oven stove for cooking and a large refrigerator that fits nicely in the kitchen area. Adding to your cooking possibilities, there is a grill outside for use in the summer. Across from the kitchen is a large French easel, an asset if you want to bring drawing pads or do some painting. Up against one large window is a country table and chairs with a long bench. One is always aware of nature whether you are using the table for something or having breakfast while looking out the windows. There is always a reminder of the larger outside world. Remaining in the Studio is the vintage barn-wood enclosed bathroom with an interesting hanging night light. It has a large antique sink, a bathtub and shower, clean colorful towels that are folded on a barn wood shelf overhead for you. As you can see from the pictures, The Woodstock Field Studio is all about fun stuff. Nothing is better than ever minute having a good time and worry-free. I grew up in Woodstock and moved to NYC to follow my music career. I became a record producer to many known artists and moved back to Woodstock to follow the family business. I live 3 miles from The Field Studio in the hamlet of Shady. This studio has been in the family since 1972, it was an art studio for many years and has a vibe that you can see in the pictures. Close to town, very private, big windows, lots of nature, You will see turkeys , dear, geese, that you can see from the Studio living room. The Bathroom is made with barn siding and great lighting. It will have clean towels and will be cleaned the day you check in. there is parking in front of the Studio. The living room is wonderful, you can look out the windows or watch Apple TV. The dining table faces outside to the field and Mt. instead of deck or patio there is a coffee table and chairs in the field. Not trying to crush the party and im sure people had fun here but when we arrived first thing happened is a mouse running in the apt. The sheets smelled bad...The electricity kept going out all the time which was kind of scary in the cold, the wifi was not working we couldn't watch movies which was very disappointing and mostly had to stay out the entire time, the hostess didn't even bother getting back to us at all which is another red flag. I do not recommend this place, very overpriced compared to what Woodstock offers. Close to Woodstock village. Fully equipped. Peaceful setting. 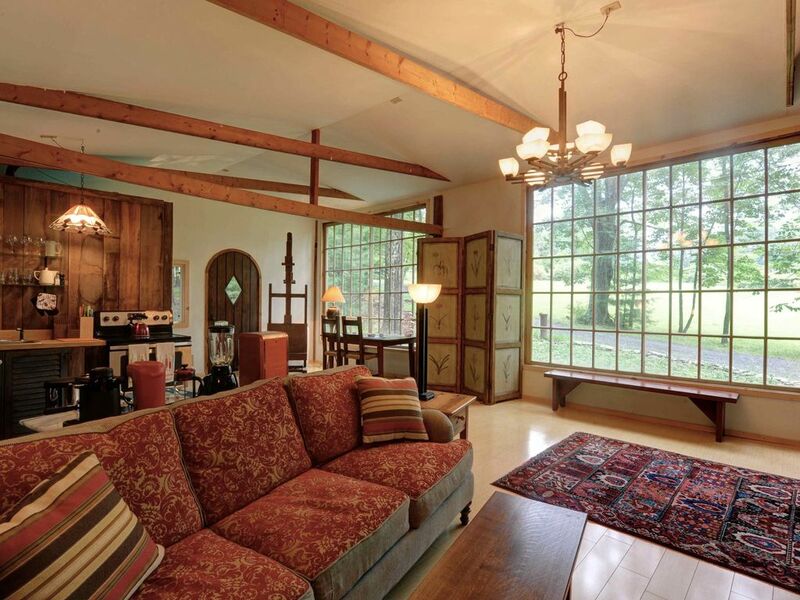 This guest left the Woodstock Field Studio in great shape, I can see they had injoyed themselves. Patio furniture needed to be scrubbed prior to use, water pressure very low, sink in bathroom spits water. Owner was very available and did take care of an issue with a bee nest promptly, but the property is basically one step above camping. The outdoor furniture may have had a few leaves on the table and we dowash them before the season, not before every guest. The water is from a deep well that tapes into a large aquifer, I have never seen low water pressure . I took care of the bees nets personally . It’s best to do this at night when it is cool and they are inside the nest. If you look at the photos of the Field Studio it doesn’t look like camping , but that is my opinion . We loved our stay in this light-filled cabin. We enjoyed the peaceful nights amongst the fireflies in the field. The stars are amazing from this spot, as the dead end street has almost no light pollution. During the mornings sun fills the cabin, waking you up slowly. A great way to reconnect with your circadian rhythm. The fire pit was also well enjoyed. We hope to return soon. Diane was a great host. The home is situated in a great location, minutes from town on beautiful land. The home has its charms, however we were quite disappointed with the poor upkeep and housekeeping. If you want to spend money to show up somewhere that feels pretty gross, then this place should be fine for you. produces a significant amount of its own heat. It’s almost like it’s a hotbox with no relief and the no ventilation makes for really uncomfortable conditions. Our son woke up overheated and we had to leave. They wouldn’t refund us any portion let alone have a conversation with us to discuss the problems of the stay. The map showing where the house is located is not correct, its down off the road on a private driveway by the field.